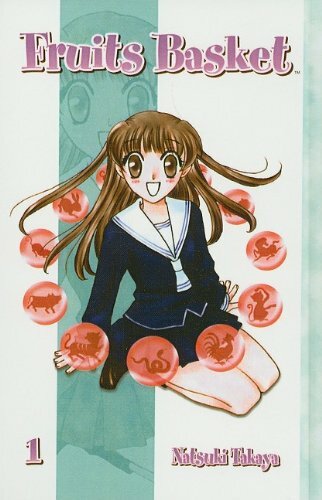 The manga Fruits Basket by Natsuki Tayaka is a very good book. It's about a young girl named Tohru-Honda, who I might refer to as Onigiri, who was living with her mother, until her mother died. After that she briefly lived in a tent until a boy named Yuki led her into the Sohma family house hold, to live in with him. Little did Onigiri know, that 'he' was a 'them' and that 'them' consists of the cat spirit Kyo, the spirit of the dog Shigure, and the one you already know Yuki the rat spirit. When she meets them she figures out that each of the Sohma's are possessed by an animal of the Chinese Zodiac, when ever the become weak or are hugged by the opposite gender, they turn into their Zodiac animal. My favorite character would probably be Momiji, he's the rabbit spirit. He's very playful and energetic, like on the first day of school he came in wearing the girls uniform because he thought it looked better on him. All in all this is a very good, cute, and funny story that I think many people will like!